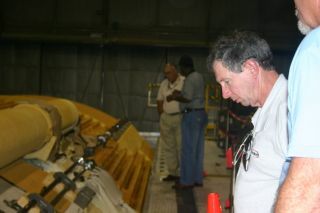 NASA chief Michael Griffin surveys damage to one of the space shuttle's external tank which occured during Hurricane Katrina. Hurricane Katrina did ahalf-billion dollars in damage at a vital shuttle manufacturing plant inLouisiana, but a ride-out crew of 37 people saved the factory from what couldhave been catastrophic damage. Located on the northeastside of New Orleans between Lake Pontchartrain and Lake Borgne, the MichoudAssembly Facility was swamped with heavy rains and battered by high winds asKatrina came ashore Aug. 29. But the ride-out crew wasable to keep generators and pumps running at the 43-acre plant, protectingeight shuttle external tanks that were in various stages of assembly. The onlydamage to flight hardware: dinged insulation on one of the 15-story tanks. "They risked theirlives," NASA Administrator Mike Griffin said. "You can't buy the kindof dedication that I saw down there from our folks for money -- for any amountof money. It's not about salary or about holding a job. It's about dedicationto the program." Katrina will be thecostliest natural disaster in the history of the United States. The stormcaused more than $125 billion in damage in the New Orleans area and along theMississippi Gulf Coast. The death toll cannot yetbe estimated. The sprawling tankmanufacturing plant literally was cut off from the outside world by the killerstorm. Only helicopters and boats could get to the factory because surroundingroadways were flooded. Food, water and othersupplies had to be flown or ferried to the plant, and the people working on theride-out crew only had access to running water one hour each morning. Freshclothing didn't arrive for more than a week. "We were fortunatethat water did not get over the levees into Michoud. There was, of course, animmense amount of flooding, but the pumps were able to handle that. It wouldn'thave happened without the people who were staying there," Griffin said. "It was really quiteprofound to see it. If you could see what they had done and were not moved byit, then you are not movable." The Lockheed Martin factoryis one of the largest employers in New Orleans. Some 2,000 NASA and contractoremployees work there. The plant was one of twoNASA facilities damaged by the hurricane. Stennis Space Center in BaySt. Louis, Miss., sustained $600 million in damage. NASA tests liquid-fueledshuttle main engines there. Katrina marked the secondconsecutive year that hurricanes have damaged NASA facilities and stalled theagency's efforts to return its shuttle fleet to service. Hurricanes Charley, Francesand Jeanne caused more than $100 million in damage at Kennedy Space Center inAugust and September 2004. Publishedunder license from FLORIDATODAY. Copyright ? 2005 FLORIDA TODAY. No portion of thismaterial may be reproduced in any way without the written consent of FLORIDA TODAY.